As a global professional in the dictation market, Philips is proud to present the LFH0667/00 bundle with Dragon Naturally Speaking DVR edition v. 10. Automatic voice to text capabilities. 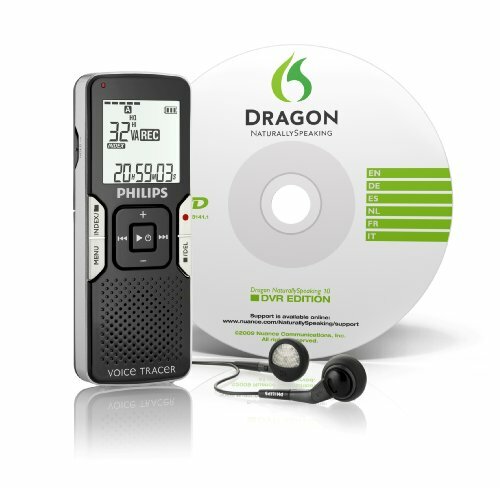 Featuring 2 GB flash memory, the Philips Digital Voice Tracer 667 records up to 284 hours in six common MP3 mono file formats (SHQ, HQ, SP, LP, SLP, PCM) and is 5 star Dragon certified for up to 99% automatic speech to text accuracy. Dictate documents on the move; when back in the office/classroom simply let Dragon automatically type out your dictations. Files are organized within four folders (99 files / folder) for easy retrieval and can be downloaded from the Digital Voice Tracer to PC via high speed USB 2.0. Also functions as a USB mass storage device, MP3/WMA music player and customizable equalizer. Features clean buttons for ease of use and the largest display in the market to view all relevant information at a glance. The adjustable microphone sensitivity is perfect for both foreground and background recording and the large front speaker (30 mm) reproduces stunning quality playback. The voice activated recording feature, when enabled, automatically records only when sound is detected, and the index mark feature lets you mark a particular point in a recording or playback for easy retrieval. Other convenient features include the ability to insert the date/time within recording and the timer recording feature programs recordings in advance. File split/auto divide feature splits recordings into separate files making them much easier to find, edit and archive. The alarm feature schedules voice alarms to remind you of important meetings or events.Other features include visual record level monitor slow and fast playback, LED record/playback, battery, and end of memory indicators.Includes an external lapel microphone, stereo earphones, neck strap, USB cable, two "AAA" rechargeable batteries and user manual.